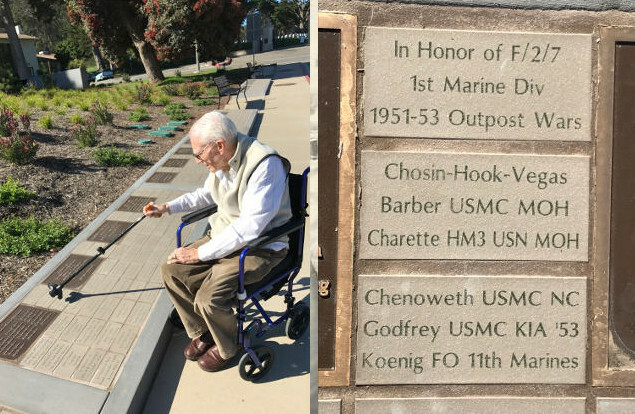 Korean War veteran Ted Chenoweth, Marine recipient of the Navy Cross and the Purple Heart, locates the tiles he commissioned for his brothers in arms. Just a few words and acronyms, but a world of meaning in those words and acronyms. Attention all Korean War veterans and families . . .
For those of you who wanted to sponsor a commemorative tile at the Korean War Memorial, but learned that no more were available, we have some good news. 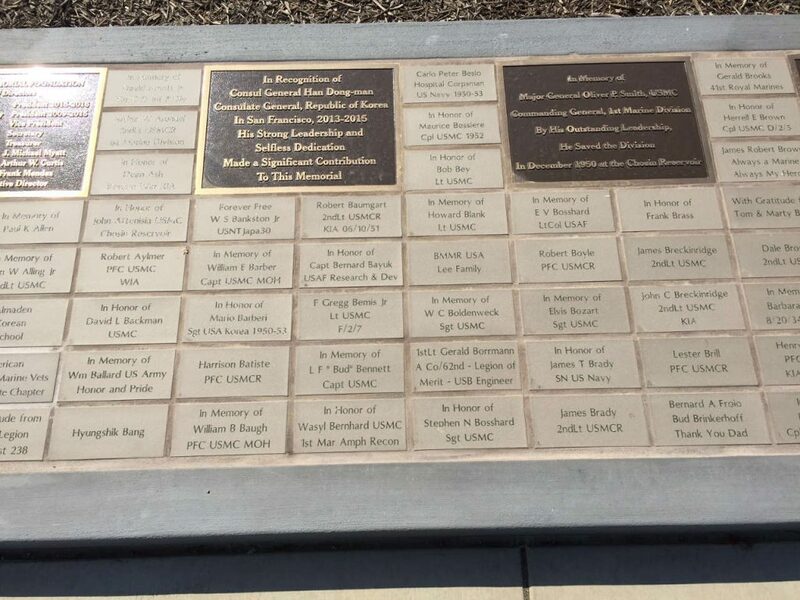 The Presidio Trust has authorized KWMF to accept requests for 72 additional 4 by 8 inch tiles, to be mounted on one final wall panel at the Memorial. We also have some bad news. At present, only 9 tiles are still available; and once they’ve been taken, there will be no more. 2. The tiles are being offered only to Korean War veterans or to families wishing to honor a close relative who served in the Korean War and who has not already been recognized at the Memorial. 4. KWMF must confirm reservations for all 72 tiles before the Presidio Trust will allow installation to proceed. If we fall short of the total, there will be no additional tiles: either 72 tiles or none. 5. Each tile requires a donation of $500 or more, to offset administrative, fabrication, and installation costs. No donations made prior to this time may be used for one of these tiles. 7. You may make a reservation now, without obligation and without making any donation. We will then contact you when we have reached 72 reservations, and ask you to submit your donation at that time. Chris will provide you with additional details on number of inscribed lines, number of characters and spaces per line, and any additional information you require. Please see sample tile inscriptions below. We encourage you to act soon, because this will be your last opportunity to honor a loved one with a commemorative tile at the Korean War Memorial.